Miss Sergison and Miss Jackson are our Year 2 teachers and they are supported by Mrs Walton and Mrs Wheatley. Miss Jackson teaches Year 2 Elder and Miss Sergison teaches Year 2 Poplar. Information about what Year 2 will be learning can be found in our ‘Curriculum’ section and under the Topic link above..
Year 2 design delightful dragon eyes! As part of our 'fire' topic, we have been learning all about dragons. We used clay to make these 'eye-catching' creations! When the clay was dry, we used metallic paint to make them look more realistic. Year 2 Making Terrific Tudor Houses! We’ve loved working together to make Tudor houses! Year 2 visited Sunderland Glass Centre as part of our science topic 'materials'. We conducted some experiments to find out whether materials were soluble or not. We also completed some great glass art work and enjoyed watching a glass blowing demonstration. T This week Year 2 have been starting to learn about the Great Fire of London. The children have been using their problem solving and team work skills to correctly order the events of the fire on a timeline. As you can see we had great fun! 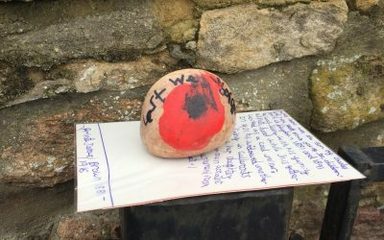 In the week leading up to Remembrance, our whole school participated in a remembrance project – where pupils decorated Winlaton community with pebbles (carefully designed and decorated by the children themselves, with the names of soldiers from World War 1 and 2) for residents to find! Harvest Festival singing! 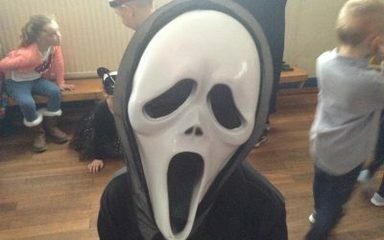 Our whole school perfoms! West Lane pupils ‘bowl’ Mrs Tetley over with their attendance! 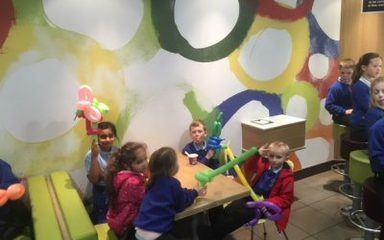 It was a pleasure to take 30 children for a 100% attendance trip on Wednesday (bowling and a McFlurry) – to celebrate getting into school every day last year! No mean feat!